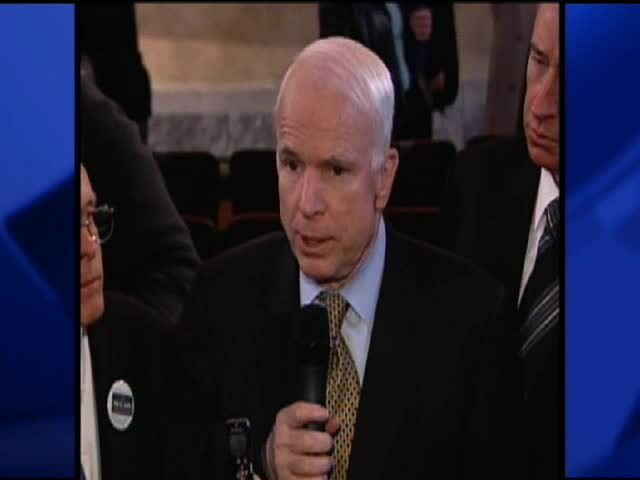 WATCH clips of Cunningham's and McCain's comments in the video players above and below. CINCINNATI – Conservative talk-show host Bill Cunningham is famous for smacking down his political opponents on WLW Radio. But Sen. John McCain, a conservative himself, gave the caustic Cunningham a taste of his own medicine on a 2008 visit to the Queen City. When it was over, McCain, the consummate gentleman, had lived up to his promise to run a respectful campaign and Cunningham, complaining that McCain had thrown him “under a bus,” was promising to abandon the Republican candidate and support Democratic Sen. Hillary Clinton. 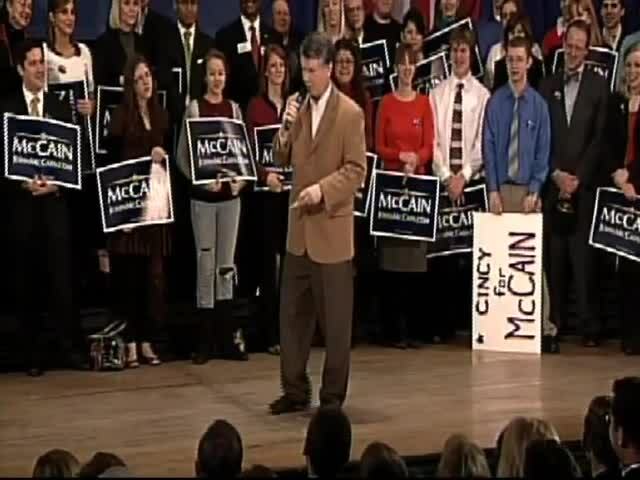 The occasion was a presidential campaign rally at Memorial Hall on Feb. 26 before the Ohio Primary. 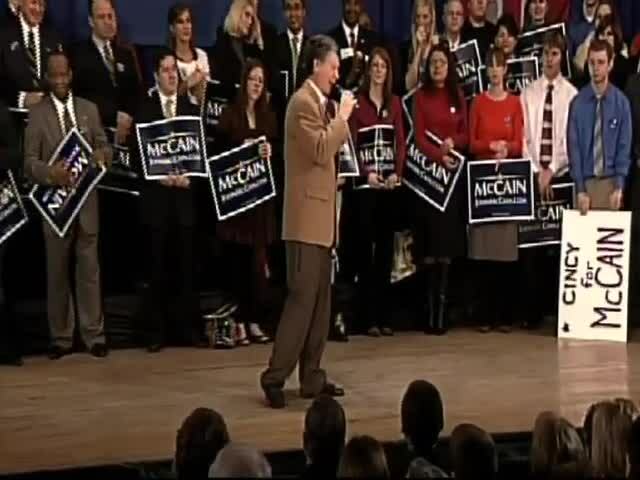 Somebody – McCain’s campaign or the local Republican hierarchy – had recruited Cunningham to fire up the crowd before McCain’s speech. McCain wasn’t even in the hall yet when Cunningham took the stage and started spewing insults at the top two contenders for the Democratic nomination, Clinton and Sen. Barack Obama. Cunningham directed most of his venom at Obama, calling him a “hack, Daley-style, Chicago politician” and repeatedly referring to him as “Barack WHO-SANE Obama” – emphasizing Obama's middle name, Hussein. It was the way Cunningham tried to ridicule Obama by suggesting he is a Muslim. "All is going to be right with the world when the great prophet from Chicago takes the stand, and the world leaders who want to kill us will simply be singing 'Kumbaya' around the table of Barack Obama," Cunningham said as he pranced around the stage surrounded by local Republicans, including Rob Portman, who was being touted as a potential running mate for McCain. Obama, said Cunningham, “is picturing himself as change. When he gets done with you, all you are going to have in your pocket is change. At some point in the near future, the stooges in the media – the New York Times, CBS, NBC - the Nobody But Clinton network, the All-Bill Clinton channel, ABC – at some point is going to peel the bark off of Barack Hussein Obama. That day will come." McCain claimed later that he didn’t know what Cunningham was going to say and it wasn’t until both men had spoken that McCain’s aides told him what had happened. By then, the traveling press corps figured they had their story. Then a McCain aide came out and told them the candidate wanted to talk to the group of them. McCain, speaking firmly, repudiated Cunningham’s remarks. “That person who was on the program before I spoke made some disparaging remarks about my colleagues in the Senate, Sen. Obama and Sen. Clinton,'' McCain said. "I have repeatedly stated my respect for Sen. Obama and Sen. Clinton and I will treat them with respect. I will call them Senator and have a respectful debate, as I have said on a hundred occasions. "I regret any comments that may be made about these two individuals, who are honorable Americans," McCain said. "I absolutely repudiate such comments and, again, I will take responsibility. It will never happen again." By then, Cunningham was gone and didn’t find out what McCain had said until the media – national and local – got hold of him an hour or so later. "John McCain threw me under a bus -- under the 'Straight Talk Express,' " Bill Cunningham told CNN, referring to the slogan on McCain's campaign bus. Cunningham told CNN that local McCain organizers had asked him to speak. “They told me to fire up the crowd … and give them some red meat,” Cunningham said. It worked, too. But in the end, it was Cunningham who got skewered.